Vienna has several farm markets and has had them for centuries; note also my articles on the Naschmarkt (the biggest of Vienna′s farm markets) and the Rochusmarkt, as well as the general one on the "Markets of Vienna". The Brunnenmarkt is a special one: It is not really advertised by the tourism authorities, since it is located in the not-overly-attractive district of Ottakring. The Brunnenmarkt is considered to be a cheaper, but smaller version of the Naschmarkt with no tourists, and because of the high percentage of Turkish residents in Ottakring, the Brunnenmarkt has a distinct Oriental taste to it. Another thing that makes the Brunnenmarkt unusual: Until very recently (2005, to be precise), the Brunnenmarkt was not a permanent market - meaning, that all the market stalls were completely dismantled after the end of the sale hours. The Brunnenmarkt Market strechtes from Thaliastraße to Ottakringerstraße. It comprises of 40 to 50 market stalls from Monday to Friday, on Saturday they increase to up to 120. This makes the Brunnenmarkt the second-biggest market in Vienna after the Naschmarkt. The name "Brunnenmarkt" means "Fountain Market" and is derived from a fountain that took water from a pipeline that transported water from the Vienna Woods to the Hofburg Palace. Around this fountain, the market developed after 1786, when Emperor Joseph II permitted the use of "his" water for this purpose. The fountain itself was removed in 1880, when the first tram was built - only the name Brunnenmarkt still recalls its existence. In 1873, the area was officially called "Brunnengasse". In 2005, the Brunnenmarkt became a "permanent" market with solid market stalls that did not need to be dismantled. The area around the market became a pedestrian zone. The items for sale include the usual "market goods": Fresh meet, poultry, fish; fresh fruit and vegetables; spices and herbs; cooking gear; sweets and pastries; special food items and delicatessen - as well as the odd tacky toy, clothing and other stuff. Nearby the Brunnenmarkt, you find the Yppenmarkt market at Yppenplatz. This little plaza just off subway line U6 has developed into a hip place; in the past 10 years or so, Yppenplatz has attracted a young and arty/intellectual crowd, alongside with bars, pubs and independent stores. Today, it is already a tad too fashionable to be still cool (and now rather pricy), but the market is still worth a closer look. The Yppenheim, by the way, is the main building at the core of the Yppenplatz - it was a community shelter of the army in the 19th century. 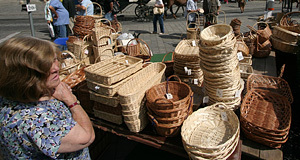 The market sells small goods like toys, little antiques and other flea-market items. Attractions nearby are very limited; note that Ottakring is not a touristy district by any means. The AKH, Altes AKH and the Western parts of the district of Josefstadt are within reach; the Piaristenkirche with a bit of a walk, and so is the Theater in der Josefstadt. Note that getting to the Brunnenmarkt is very easy with U6, and so getting away and back to the city centre is no problem either.